RAM Imaging carries a variety of dedicated software solutions such as RIP Software, Color Management Software as well as Raster Viewing and Editing Software. We have recently also added AutoCAD Lite to our line. We also carry the IBM Lotus Foundations Server and offer Anti Virus and Anti Spam software solutions. Why do you need Colour Management? Colour Management is essential for today's complex digital imaging technologies. There are so many variables to contend with such as cameras, scanners, displays, printers, customer files, legacy documents, media and ink types. 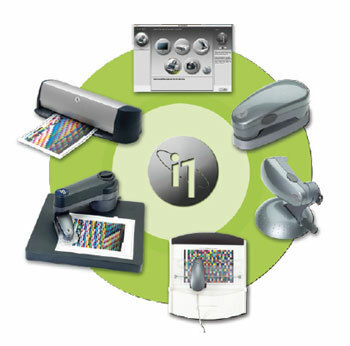 x-rite i1 Solutions enables you to deal with challenges such as: Accurate on-screen and projected colour, digital camera files, scans and client-provided colors, monitor to printer colour matching, print to print consistency, spot color measurement and PANTONE accuracy. Contact your RAM representative at 416.748.8455 to select the i1Solution that best suits your needs.